Now that we’ve all had some time to look through the new Warhammer 40k Codex: Adeptus Mechanicus, we thought we’d finally write an article about it! First we’ll talk about some of our favorite units then we’ll share some of our favorite lore. We’ll also look into several of the new Forgeworlds and what they can do for your army. That includes strategiums and relics now! Finally we want to go over some ways to make AdMech great again in our Warhammer Codex Review: Adeptus Mechanicus. The new codex adds a lot of new rules even if it didn’t bring any new boxsets with it. My personal favorite unit in the codex has got to be Sydonian Dragoons and their cousins, Ironstrider Ballistari. I especially like the Dragoons because of how they can synergize with some of the Forgeworld dogmas and strategiums. They do have a rule that they are -1 to hit in shooting base which helps them get where they need to go. They also strike at strength 8, -1 AP, and do 2 damage and get extra attacks on 6+ to hit. The Ballistari can take special lascannons that used to be twin-linked. That means they get two lascannon shots now and can advance and fire them (even though they’re heavy) at a -2. They can be an incredibly mobile fire base since their base BS is a 3+. At their relatively low point cost, they can be an effective substitute for the point sinks that are Onager Dunecrawlers. Our resident AdMech player Dernicus’s pick was Kastelan Robots and Electro Priests. The Kastelans can put down withering amounts of fire and are pretty resilient in an edition that’s very killy. The Electro Priests come in two varieties, Corpuscarii and Fulgurites. The Corpuscarii dish out a ton of strength 5 shots at short range by shooting lightening reminiscent of a Sith Lord. The Fulgurites are more suited to melee, can become more resilient as they kill enemy units, and have the capability to dish out mortal wounds. The codex adds about a page long description for each unit and character. Most Foregeworld also get a fair amount of background. My favorite pieces of lore are on Bellisarius Cawl and then for the Agripinaa Forgeworld. In Cawl’s entry, Games Workshop describes how Cawl has so much knowledge he has literal data libraries devoted to his memories. In fact Cawl has created multiple instances of his own consciousness to work on many projects at once and then puts himself into stasis when he needs a nap. This little tidbit seems to explain why I see so many different Cawls on the tabletop! My second favorite piece of lore is all about Agripinaa, the Forgeworld unfortunate enough to be right next to the Cadian Gate. This has made the Forgeworld experts in defense but the entry also specifically references a mysterious swell in their ranks of servitors. Strange how there a millions of refugees fleeing to the planet after the fall of Cadia and now all of a sudden there a bunch of extra servitors huh? This translates onto the tabletop because of Agripinaa’s special strategium. The Fresh Converts strategium lets you spend a number of CPs (depending on PL) to bring back a unit of Kataphron servitors at full strength. Not bad! Speaking of special strategiums, let’s take a look at a few Forgeworlds. We’ll look at Mars, Ryza, and my favorite Stygies VIII. Each gets a special dogmas (like chapter tactics), strategiums, relics, and a warlord trait. Dogma: Focused on Canticles, you can roll two dice and take both. With access to Bellisarus Cawl and his manipulation of Canticles, this is great. Strategium: Wrath of Mars lets a single unit do a mortal wound to their target on a 6+ to wound. Deadly on Corpuscarii and Kastelans. Relic: The Red Axe is probably the only disappointing part of the Mars Foregeworld. It’s a slightly better axe. Warlord Trait: The Mars warlord trait adds 3″ to any auras on your Warlord. That’s a pretty massive area of effect on some characters. Did I mention you get Cawl? Dogma: The weakest part of this Forgeworld is probably its dogma. You can reroll to wound rolls of 1 in the fight phase. Not great unless you plan on using Sicarans which took a hit in the codex. Strategium: Plasma Specialists lets you add +1 to wound and +1 damage on all Plasma weapons. We’ll talk about how to chain this up later. Relic: Weapon XCIX is a super charged volkite blaster with a little extra damage and the ability to cause mortal wounds. Warlord Trait: Your warlord can add +1 strength and +1 damage to a weapon that isn’t a relic. Dogma: The best part of Stygies VIII is its dogma, -1 to hit if the enemy is outside of 12″. Pair with Dragoons or any gunline. Strategium: Clandestine Infiltration lets you deploy a squad immediately before the first battleround has begun if they are outside of 9″ from enemies. Pretty good on units like Dragoons or Fulgurites. Relic: A Jakaero enhanced glove that shoots lasers lets the bearer roll a 4+ on every enemy model within an 1″. If it succeeds, they take a mortal wound. Warlord Trait: Stygies VII looks like the Forgeworld that just hates xenos because their warlord trait gives the warlord +1 to wound against anything without the Chaos or Imperium keywords. Play testing some builds and checking the numbers on a couple of units has been pretty fun so far. Dernicus has devised a nearly all Kastelan list that uses Mars dogmas as well as an Ryza Plasma storm list. I’ll probably be buying several more Sydonian Dragoon kits for a small Stygies VIII detachment to supplement the rest of my Imperial army. Don’t forget Enginseers are HQ’s now! Pretty nasty. Oh did I mention that’s only a squad of 6? Because they can go up to 12 models in a squad. Now in every game he’s played, Dernicus’s opponents have gone for the kill on that unit. If he goes first though he’s done a tremendous amount of damage. While maybe not the most survivable unit, the Kataphrons can really put a hurt on certain armies. We’ll see how it does in some upcoming tournaments. Now that we’ve seen some of the shooting AdMech can do, let’s take a look at those Stygian (?) Dragoons! With the Stygies VIII dogma Sydonian Dragoons are going to be at a -2 to hit if the enemy is outside of 12 inches with a static -1 if the enemy is closer than that. The Stygies VIII strategium lets them infiltrate a unit so I’ll be taking a 3 Dragoon squad. 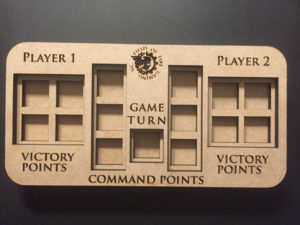 They have to deploy outside of 9″ but have a 10″ move so you should be able to get the charge off or deploy them far enough back to be protected if you don’t have first turn. Not bad when you consider the whole unit only costs 204pts. Take an Enginseer as an HQ, you can do that now. A unit of 3 dragoons and then 2 individual Ironstriders with lascannons makes a nice little Outrider Detachment that is cheap and somewhat durable thanks to the -1 to hit. I’m really glad to see that the AdMech got some extra fluff and rules in this codex. I don’t think it’s going to be very competitive on its own but hopefully it’ll be a valuable addition to some Imperial Soup armies. The Forgeworlds feel mostly balanced other than Mars. It’s the only one with a character so it’s always going to be the question of “Why aren’t you taking Cawl?”. We’ll see if someone finds a way to cheese it out but right now the Cawl gunline seems to be king. Overall I hope to see more AdMech on the tabletop now that they have more options.